Some scuba divers under the Blue Heron Bridge had a close call with a sailboat, and the whole thing was caught on video by people on a nearby dive boat who happened to have a camera. You can hear reaction from onlookers who were on Jim Abernethy’s Scuba Adventures. As horrified onlookers watched, the sailboat captain just kept right on going, apparently ignoring the fact that there were divers and diver-down flags in the water. The captain had just plowed right through the middle of them. “I cannot believe he just did that! That was unique in idiocy. Cap, I’m taking that video to the Coast Guard station. That was unbelievable! I warned you before you did it and you did it anyway! You’re unbelievable, Cap! They need to check your license,” said an onlooker. Luckily none of the divers were hit. We showed that video to two dive instructors. Why should James Bond be the only one with a swanky aero sub ? If you’ve got the cash, Sir Richard Branson is more than happy to lend you his for the day. The Necker Nymph, which resides on Branson’s luxury catamaran, the Necker Belle, is an open-cabin three-seater sub. It dives down to a depth of 30 meters, a top underwater speed of 6 knots, and can remain submerged for up to two hours. Both passengers wear normal scuba breathing gear—no, you don’t get to drive this one-of-a-kind winged submarine, there’s a pilot for that. A day-long rental will set you back $2,500 and unfortunately does not include Barbara Bach. We’ve all heard of the Pirates of Penzance, and the Pirates of the Caribbean. But have you heard of… the Pirate of Monterey? For April and me, one of the most interesting aspects of treasure hunting is the history that comes alive through the research that must be done before, or after, a new treasure discovery is made. Whether it is treasure we’ve discovered, or items discovered by other “treasure finders” we work with all over the world, research is often where a hunt begins, and it most certainly ends. And it is this documented history that gives our treasures even more value – to know exactly when and where a treasure was found gives voice to history. It is no longer a “coin I found in Grandpa’s old shoebox,” but rather a living piece of history with a story to tell. Another fun part of this business is getting to name a treasure discovery. 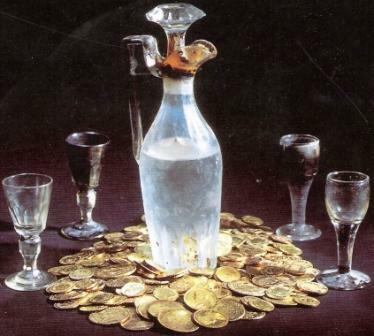 On several occasions over the years, we have been either the first or among the first people to see a treasure cache since it became lost hundreds of years ago. And so is the case with the Refugio Bay Pirate Cache. Did you know that Monterey, Calif., was once a part of Argentina … for six amazing days? The tale begins with the French and Argentine pirate, Hippolyte de Bouchard. Bouchard was the first Argentine to circumnavigate the globe, and he attacked Monterey in search of Jesuit and Franciscan treasures he had heard were secreted away in California’s Spanish missions. Now, on to the lost treasure part of this story! On Nov. 18, 1818, Bouchard arrived off Monterey. Even though they didn’t have “texting” back then, (stay tuned for my column “What if Pirates Texted?”), the Spanish had been forewarned that ol’ Hippolyte was on his way and had moved all their valuables and civilians inland. For six days, Bouchard and his men sacked the settlement (not to be confused with the relatively docile “sacked” in football parlance); swords were drawn, cannons fired, and by Nov. 24, the Argentine flag was flying over the Spanish fort at Monterey. Scott Cassell already holds the record for longest non-stop dive but is ready to break it again while trying to preserve ocean life. 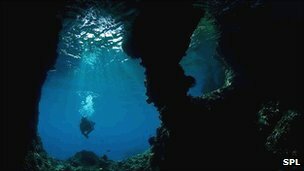 On September 17, the explorer and combat/commercial diver will attempt a 30-mile (48-kilometre) non-stop SCUBA dive from Catalina Island to Los Angeles, gathering information about shark population and what the ocean actually holds, a task that only human effort can accurately collect. From 1,000 ft. to 3,000 ft., he will be diving through two great white shark strike zones, and an area that has been known to contain very large Mako sharks, to calculate how many sharks there are in Southern California. Aside from sharks, other dangers Cassell is prepared to face include hypothermia, decompression sickness, extraordinary currents, equipment failure, and physical exhaustion. For this diver, however, his safety, although important, is not top priority. Cassell considers himself a man who takes responsibility for everything in his world. In this case, that’s the ocean and the animals that dwell underneath. Even in utero, marine researcher Brent Stewart was on the move — and he hasn’t stopped since. Conceived in Florida, Stewart was born 56 years ago in Alaska, then raised as an Air Force brat in Morocco and France before graduating from high school in Spain. Today, he keeps a desk at the nonprofit Hubbs-SeaWorld Research Institute that overlooks Mission Bay, but he’s much more likely to be in the Channel Islands. Or Greenland. Or West Papua. Or Antarctica. His globe-trotting has a goal. Stewart tracks various marine creatures in hopes of documenting their travels and ultimately conserving the species by protecting vital habitats. He and two other researchers from San Diego will be honored in October by the Explorers Club with an award shared over the years by some of the most famous names in exploration, including Carl Sagan, Sir Edmund Hillary and Wally Schirra. Based in New York, the Explorers Club counts about 70 in San Diego County among its 3,100 members worldwide. It was founded in 1904 to give adventurers a place to share their triumphs and trials with peers, a function it retains even though the concept might seem outdated in the 21st Century. Members must contribute to the body of scientific knowledge, either with a discovery or adding knowledge about a discovery. A few of them, including Stewart, pack one or more of the club’s 202 numbered flags on their journeys as they stake new claims for science. San Diego boasts one of the most active chapters in the world, in part because of the oceanographic trendsetters at UCSD who figure prominently into the history of exploration. “When the club was initially founded, it was to define the map,” said international club President Lorie Karnath, who splits her time between New York, Berlin and Normandy, France, when she’s not on an expedition. “Today I feel the stakes are much higher because we are working to balance and preserve and sustain our planet. … You still have all the excitement and thrill of exploration, but you also have a very important purpose. “Oh, great,” replied my wife, Martha. Not 30 seconds before, our granddaughter Brittney, two other scuba students and their instructor had slipped over the side, disappearing underneath, leaving a trail of faint and lazy bubbles. I’m not going to nap now. The skipper added, “Oh, it’s only a reef shark.” His voice was as calm and flat as the water. He might as well have said “tadpole.” I accepted his knowledge and assurance, though the ensuing 30 minutes seemed like the longest half-hour of my life. The reef in question is the Great Barrier Reef. We’re bobbing just off Green Island due east of the northern reaches of the Australian state of Queensland. We’re on the third day of a trip inspired by Brittney. When she’d graduated from Woodcreek High School in Roseville a year earlier, we told her we’d take her wherever she wanted to go. Her twin passions are environmental science and fashion design. She pondered the fashion sense of Florence, the environmental drama of the Amazon rain forest. When she settled on the Great Barrier Reef, I drew up an itinerary I’d hoped would deepen and refine her interest in environmental matters. She and the others soon bobbed up beside the boat. She climbed aboard, and through chattering teeth told us of the exotic fish, colorful coral and a giant clam she’d just seen. She’s oblivious of any shark in the vicinity. And beer does flow generously in and about Cairns, thanks in part to the area’s many Irish pubs. I was perplexed, however, why so many young Aussies shunned their fine homegrown brews in favor of insipid Corona, especially at $9.50 a bottle. A local bloke set me straight: “Marketing, mate,” he said. A subterranean river said to be flowing beneath the Amazon region of Brazil is not a river in the conventional sense, even if its existence is confirmed. The “river” has been widely reported, after a study on it was presented to a Brazilian science meeting last week. But the researchers involved told BBC News that water was moving through porous rock at speeds measured in cm, or inches, per year – not flowing. Another Brazilian expert said the groundwater was known to be very salty. Valiya Hamza and Elizabeth Tavares Pimentel, from the Brazilian National Observatory, deduced the existence of the “river” by using temperature data from boreholes across the Amazon region. The holes were dug by the Brazilian oil company Petrobras in the search for new oil and gas fields, and Petrobras has since released its data to the scientific community. Using mathematical models relating temperature differences to water movement, the scientists inferred that water must be moving downwards through the ground around the holes, and then flowing horizontally at a depth of several km. They concluded that this movement had to be from West to East, mimicking the mighty Amazon itself. A true underground river on this scale – 6,000km (4,000 miles) long – would be the longest of its kind in the world by far. But Professor Hamza told BBC News that it was not a river in the conventional sense.